This summer I made the goal to eat fresher and healthier, so when I was asked if I would like to check out Slimmer: The New Mediterranean Way to Lose Weight I thought it might be interesting. In just one year, Harry Papas gained 110 pounds. Then he lost it all for life. Papas, a certified dietician in Greece, shed the pounds by creating a simple yet revolutionary nutrition plan: a delicious, low-fat Mediterranean diet coupled with the self-awareness he needed to combat the triggers that contributed to his weight gain. Unlike other diets, Slimmer's three-cycle, richly varied meal plan doesn't restrict you from enjoying carbs, sugars, or fats, and it doesn't enforce calorie counting. Rather, the nine-week program is designed to help you stay slim while actually enjoying what you eat, encouraging you to adopt a simpler lifestyle and lifelong healthy habits. This easy-to-follow plan will allow you to get rid of those unwanted pounds with incredibly flavorful and satisfying meals, full of sustaining, wholesome foods—such as fresh fruits and vegetables, olive oil, and yogurt — that have been enjoyed for centuries by those in the Mediterranean. This book is packed with incredible and delicious recipes. I'm slowing working my way through the book. 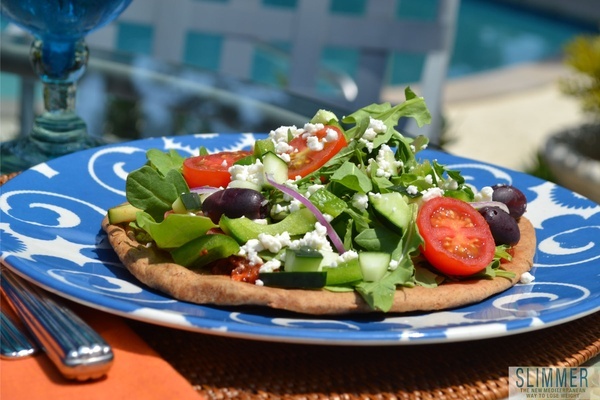 My favorite so far is Slimmer Greek Salad Pizza. Slimmer Greek Salad Pizza (recipe from Slimmer: The New Mediterranean Way to Lose Weight by Harry Papas, recipe used with permission, book to be released in June 2012, to buy the book click here or visit website at www.theslimmerbook.com) Serves 1. 1. Preheat the oven according to pizza crust directions. Place the crust on a baking sheet and spread the sauce over. Chop the olives and sprinkle them with the crumbled feta over the sauce. 2. Bake according to package instructions until the cheese melts and the pizza is well heated and crisp on the edges, about 12 minutes. Remove from the oven and transfer to a serving dish. 3. Toss the salad with the dressing in a medium bowl and pile on top of the cooked pizza. Serve immediately. 1. Combine all the ingredients except the herbs in a medium saucepan. Bring to a simmer over medium heat, stirring often. 2. Reduce the heat to low and cook, stirring occasionally, 10 to 12 minutes. Add the herbs and cook a further 3 to 5 minutes. Taste for seasoning and set aside to cool slightly. 3. Blend on low in a blender or food processor or with a handheld blender just until smooth. The sauce can be frozen in a tightly sealed container for up to 3 months. 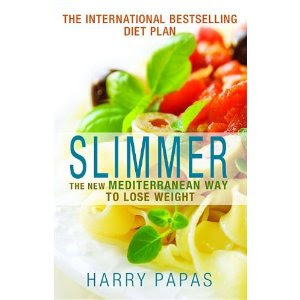 Slimmer: The New Mediterranean Way to Lose Weight just came out this month. If you're looking for a healthier way of eating, this might be right up your alley.